Arriving in a sunny, fairly warm ‘Windy City’ Thursday prior to race day, I acclimatised and ate plenty of the famed Chicago deep pan pizza. The expo, held at the huge McCormick Place, one of the largest buildings of its type in North America (picture Wembley Arena times ten), delivered pretty much standard as per others we had been to; nutrition, a selection of other races around the USA & Europe and of course more Chicago deep pan pizza. Bib collection was organised and swift. 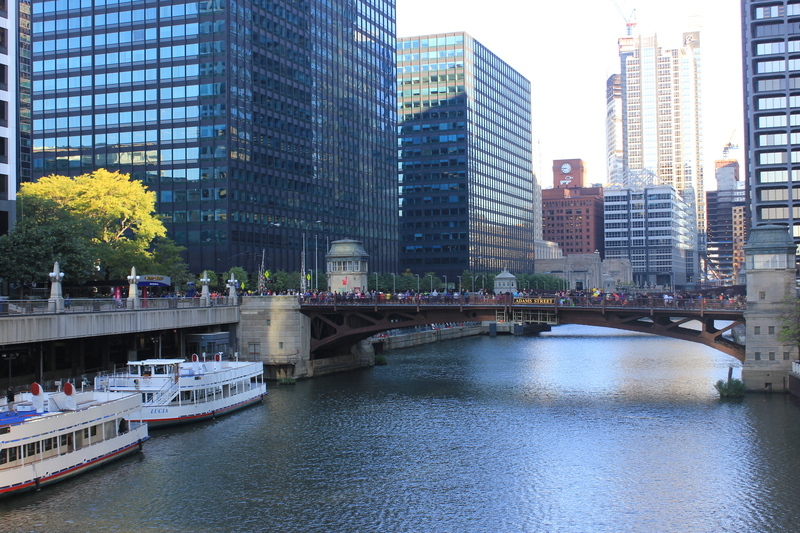 The marathon start and finish was situated downtown in Grant Park. With one of the earliest start times, 7.30am, it was an early Saturday night with the alarm set for 5am. Walking up the South Loop end of State Street from our hotel to the station in the early light of the morning I was pleased we were with fellow runners as I must admit the surrounding areas of South Loop did not seem that welcoming. We agreed that staying North of the city centre would be preferable if we had our time again. A note to anyone travelling the transport system in Chicago, have the correct money as no change is given on buses or trains. Luckily the friendly station assistant let us have a free journey instead of having to pay $20 dollar for a $5 journey on the machine. Arriving at Monroe metro stop it was a five minute walk and we were in the throngs of thousands of other runners heading towards the start line. Thankfully I was in Gate 1 so it was not a long walk up Millennium Avenue. Final prep done on the pavement, and a quick picture with Ro courtesy of the local cops and I was off into my corral. Sun just rising up and blue skies breaking through I was in my corral fairly swiftly as there were hundreds of marshals around to guide you. With the PA announcer warning us of less than adequate running conditions for the race, warm sun and lack of shade expected later, it was a rousing USA anthem sung live which I think got everyone going, certainly the goosebumps were up on my body. Elite runners off and gone, it was about eight minutes later that my corral shuffled over the start line and there it was, I was away and running the Chicago Marathon. 29 neighbourhoods awaited me, from Greek Town to Chinatown to Mexico and so on. 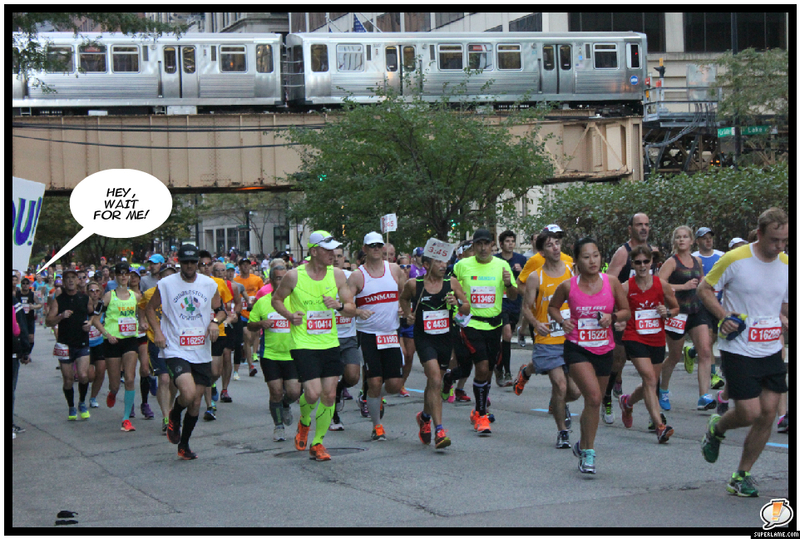 A predominately flat course, we eased out of Grant Park and onto Columbus Avenue to cross the first bridge over the Chicago River. With water/aid stations every 1.5 mile or so and with the ever increasing sunshine, they were going to be much needed. Crowds were starting to build and bearing in mind it was before 9 am on a Sunday morning, they were not shy of shouting out encouragement. Heading north and up through Lincoln Park for a couple of miles, I was feeling good, enjoying the atmosphere and skyline and wishing everyone I knew could be here to experience this. Yet again, as with Tokyo Marathon, I got a tiny bit emotional with the realisation of where I was running, and the feeling of thousands of other runners from all over the world running with me. This seems to always get me going. Coming out of the park we did a loop and started to head south again. Passing through various towns I was hard pushed to determine which was which. Crossing back over the river on a different bridge at around the 12 mile mark I was pacing well, following the 3:45 pacers but at the same time conscious of the ever increasing sunshine and heat. Crowd support was good, plenty of ‘Go Dano’, ‘You Got This’ could be heard, possibly some of the loudest cheering I have experienced at a marathon. Even more so than London. Water & aid stations were very well manned and again with ever increasing support from the marshals also. The stations we well separated with Gatorade drinks first then water next. Not far on was where I saw my ever present supporter, my good lady Ro. A quick kiss, high five and I was off again. Passing the 13 mile mark dead on schedule for a 3:40 finish all was good. The pacers were doing their job however the flags they carried were extremely small so if you fell off pace amongst a busy part of the course it was easy to lose track of them. Thankfully I managed to keep close enough. Heading out west of the city, we passed through or very close to Greektown. Back on a loop again we were nearing to Little Italy going south around the 17 mile mark. Again, with concentrating on my race these towns did pass me by without much notice unfortunately. Still on course for a 3:40, possibly sub, it was around here that my left leg started to cause me problems. Going into the race, for 3-4 weeks beforehand, I had been struggling with a possible minor tear around the calf area, despite my physio working on it regularly. Muscle injuries as we know take forever to heal. Now experiencing my first ever real race day injury, it was a case of managing it correctly so not to make it worse and to finish the race. My finish time was going to pot but more than anything I did not want my first DNF. The sunshine was now really heating up and with the lack of shade along the wide roads of Chicago, this was starting to affect me as well. Managing the injury made my running posture/form change, so now I was putting more weight onto my right leg causing other aches and strains to arise. Pushing on and watching the pacers disappear into the distance, I entered Chinatown. This town you could not miss, plus Ro and I had walked through it on our first day. Through the arch entrance it was here that I had to pull over and stretch my leg, hoping that a minutes stop or so would alleviate the discomfort a bit. With the cheering and continuous shouts of ‘Go Dano’ ‘Don’t Give Up’ I was soon on my way, knowing that I had under 5 miles to go. Stopping at every water/aid station now I saw Ro for the final time a few miles from home. Stopping to moan about my leg, she urged me onto the finish. Up into Michigan Avenue for the last 2 miles or so,I was in quite a bit of discomfort and my running style was something to behold. Grabbing drinks and banana from the stations and with the marshalls updating us on how far was left I knew then I would be finishing. Even if it was not going to be the time I had wanted. Thankfully with it being a fairly flat course, the only thing to manage other than my injury was the heat and with slowing down over the last several miles I had enough energy to get me into Grant Park for the finish line. Coming down into the last 200m, with grandstand either side, crowds cheering, red carpet finish, I was done. 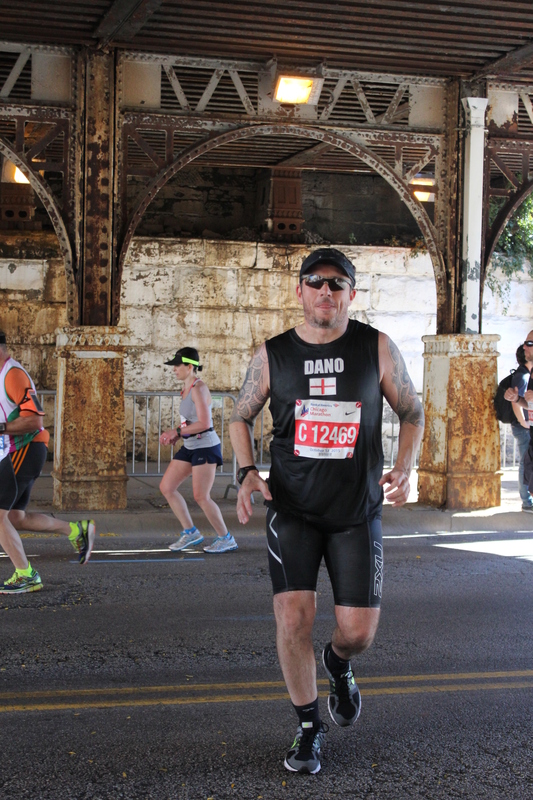 Chicago Marathon was completed in 4:01. 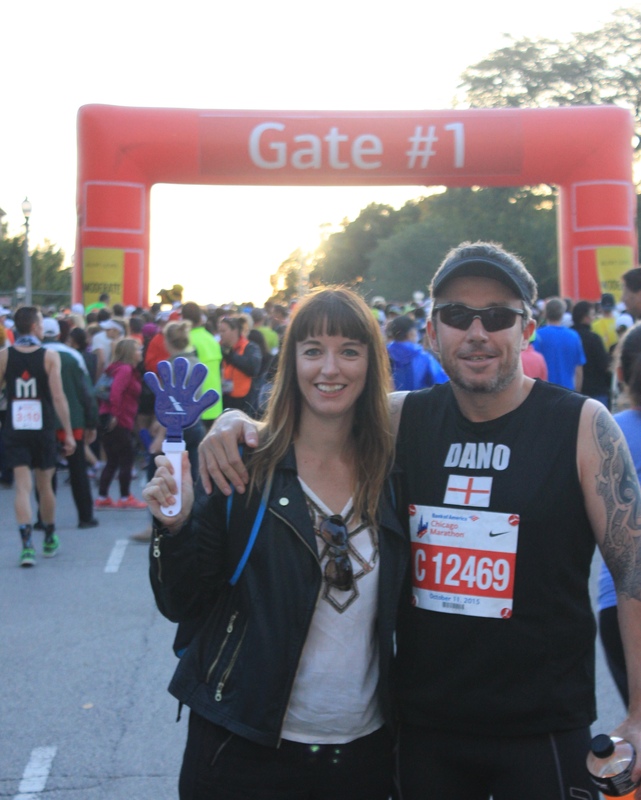 My fourth world major, tenth marathon in tenth country across a third continent. I could not have been happier. Medal finally across my neck it was freebie heaven walking through the finishing process; fruit, chocolate protein drinks, beer. I was laden down with a bag of treats. Marathon photo done, it was now a walk back up to Gate 1 to find Ro. All in all a great experience, one of the best supported I have experienced and a good flat, scenic course. Now it is onto the final two world majors, New York and Boston. By hook or by crook I will, within the next year or two, realise my WMM dream.